Red Tent at Artist Point, Washington. Artwork by Nikki Frumkin. 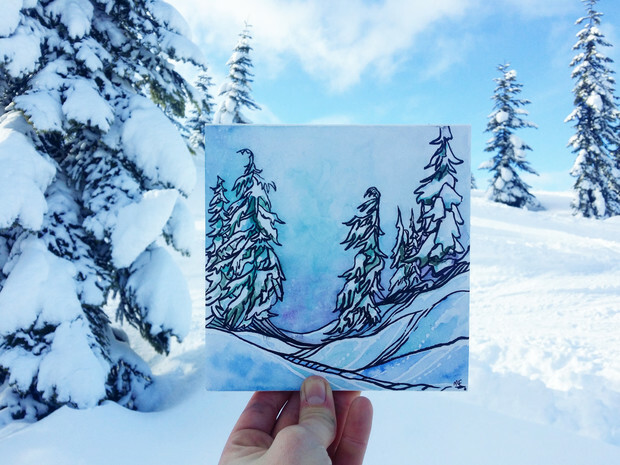 When Nikki Frumkin moved to Washington three years ago, she realized that some of the best and most beautiful places aren’t easy to get to. The satisfaction in enjoying a place that few people have been to, and the hard work of getting there, drew her to mountaineering, as did the constant motion of the mountains—the clouds, the air, the trees—all giving her energy, and inspiring her. 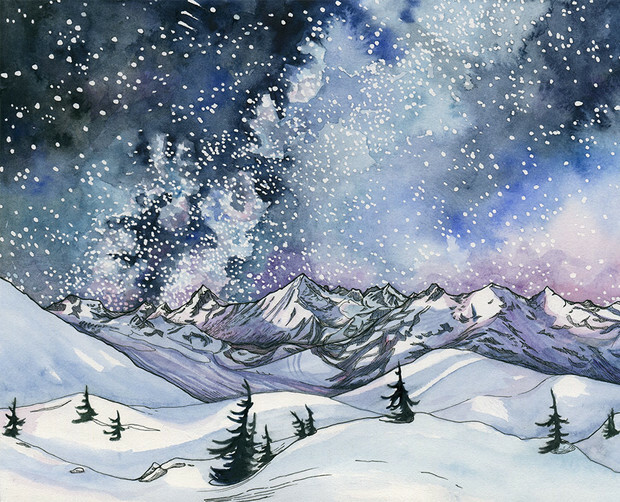 Her work is dreamy, full of rich colors, and often filled with starry skies. 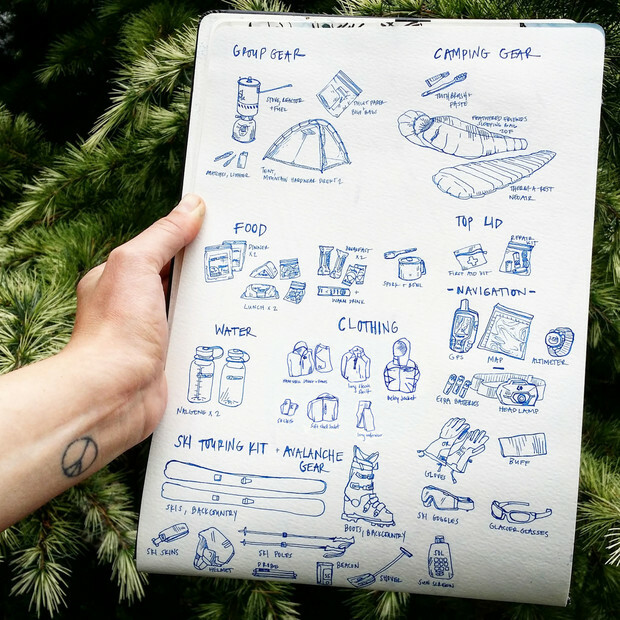 Nikki often paints her gear lists before trips, “as a way of focusing on the climb,” and thinking big picture about the adventure ahead. On any given trip, you’ll find a ziplock bag with a few pens, a water brush, a sketchbook or paper, watercolors, and some toilet paper in Nikki’s backpack. Nikki in her red tent at Artist Point. Shawn Murphy photo. 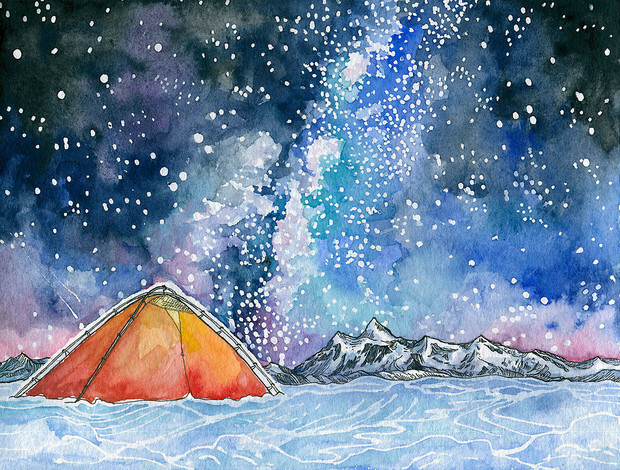 While others are eating or resting, Nikki’s searching for something beautiful to paint. She prefers to paint en plein air to capture the movement and energy of a landscape. Once she finds the right spot, Nikki plops down on her backpack and pulls out her supplies to get lines down on paper. A painting can take anywhere from five minutes to a few hours—how long usually depends on the weather. If it’s sunny, she’ll paint for 20-30 minutes. If it’s cold and snowy, she likes to keep it fast or loose—a quick 5-10 minute sketch, adding watercolors as quickly as possible. I fill my water brushes with vodka because it freezes at a lower temperature and I can keep painting longer! Fast-paced mountaineering trips often mean fewer materials and less time, so Nikki tries to keep drawing fast and loose. Her favorite paintings are the products of motion, just like the mountains that she loves: using energetic lines and whole body or arm movements to put the experience of the landscape and the adventure into the piece. Prints in the studio. Nikki Frumkin photo. Mount Adams in all its majesty. Artwork by Nikki Frumkin. 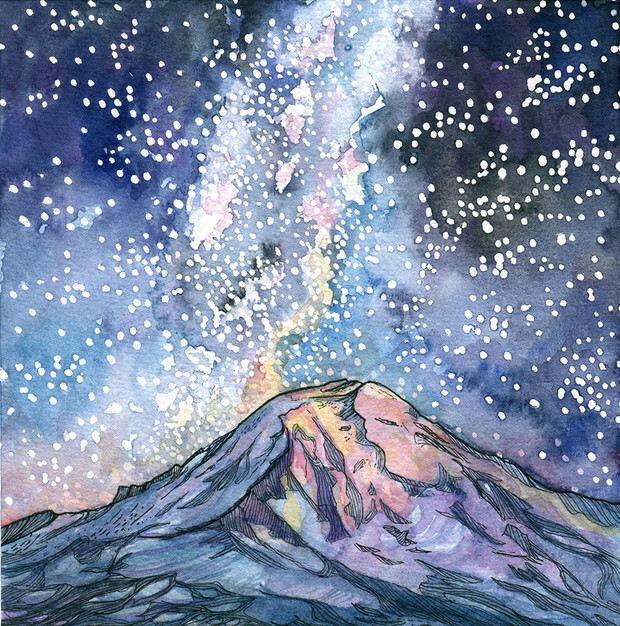 Nikki’s current goal is to ski and paint all of Washington’s volcanoes, preferably from the summit—this season, she got two: Mount Saint Helens and Mount Adams. 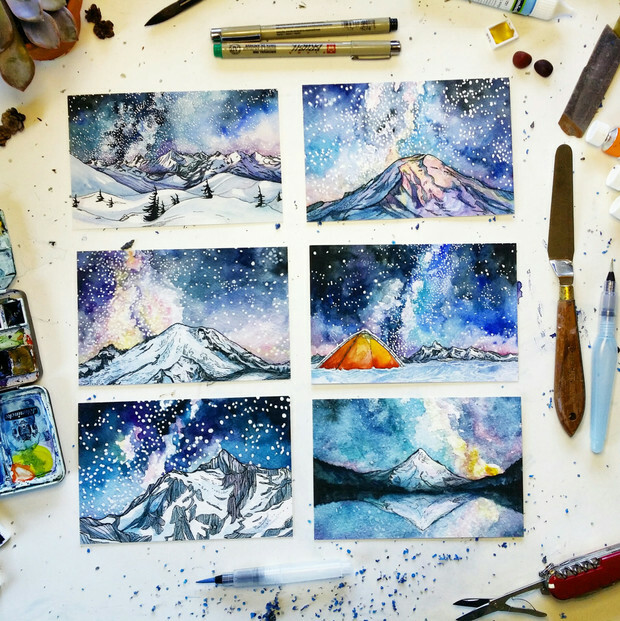 Outside of Washington, she dreams of skiing the Haute Route from Chamonix, France to Zermatt, Switzerland, painting along the way. Hanging out atop Mount Rainier. Nikki Frumkin photo. 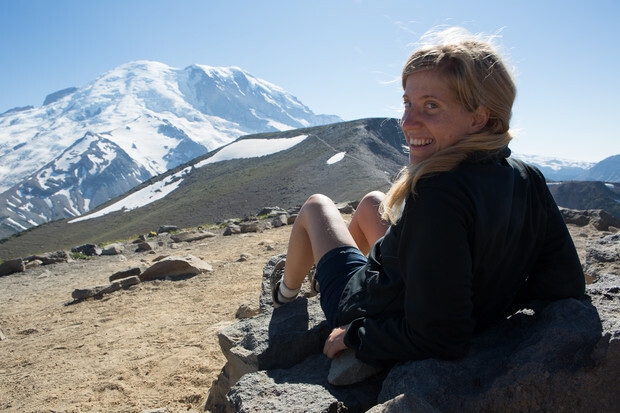 This gal is no stranger to the difficulty of balancing and supporting an outdoors-minded lifestyle with “real life,” but has a great place to do so in Seattle. “It takes a lot of energy!” The preschool that she is a teacher at shares her values of learning through play and nature—but luckily, she says, she gets to take time away from preschool to hang out in the mountains. “My weekends are for adventures,” she tells us. “My family is from and lives in Switzerland, so I go visit them as much as I can.” Her twin sister, Anna, is also an artist and climber, so they get right to it when they visit each other. The Cascades in the winter. Nikki Frumkin photo. Nikki has gained quite a following on Instagram, and has lots of exciting things in the works in the studio. Currently, she’s working on a few commissions and a big painting inspired by the drawings she did on Mount Adams—they’ll be on Instagram soon, so watch out for them! Winter in the North Cascades, by night. Artwork by Nikki Frumkin. 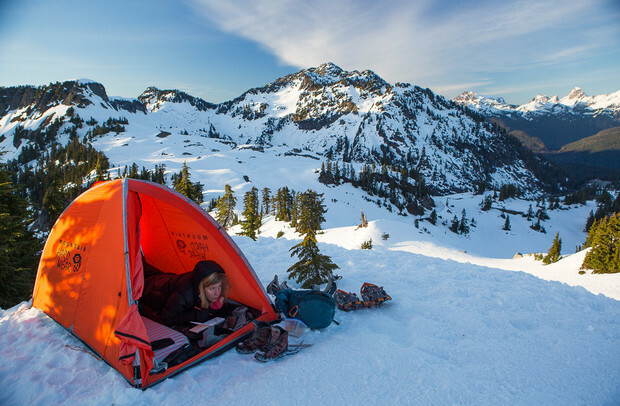 “One of my favorite stories is from a backpacking trip to Enchanted Valley on the Olympic Penninsula. After about 13 miles of hiking, we got to the chalet which sits at the edge of the Quinault River and I saw something big moving. I must have been tired, because I said, 'A cow!' From behind me I could just hear Shawn laughing because it was really a little black bear! There was no way a cow would be at this point of the valley. Check out Nikki’s work here!